Surfland Bait and Tackle – Plum Island Fishing » January 19. Marine Pfc. Eric Currier killed in Afghanistan. January 19. Marine Pfc. Eric Currier killed in Afghanistan. LONDONDERRY, N.H. — Each summer, Stephanie Culbert would await the return of her friend, Eric Currier, to Plum Island. He would arrive to spend the summers on the island with his grandparents, Russell and Judy Currier, Culbert’s neighbors for the summer months. Stephanie and Eric would spend the summer days like many on the island — fishing, boating and swimming. They would stay in touch throughout the school year, as well. The two remained close into adulthood and Stephanie watched as Eric filled his goal he would always tell her about — to join the Marines. Pfc. Eric Currier, 21, of Londonderry, N.H., was killed in Helmand Province Afghanistan last week by enemy fire. 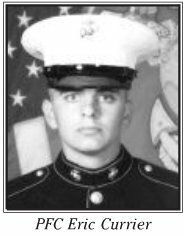 Currier’s brother, Brent, 19, said Eric was shot in the chest by an enemy sniper. He was the son of Holly Boudreau of Londonderry and Russell Currier Jr. of Methuen. He was the stepson of Kevin Boudreau of Londonderry. Eric was assigned to 3rd Battalion, 6th Marine Regiment, 2nd Marine Division, II Marine Expeditionary Force, Camp Lejeune, N.C.
“He was bounding to the next barrier,” said Brent, an Army private. Brent said Eric joined the military in March and was deployed to Afghanistan on Jan. 6. “He was always there for everybody; he was always there if you needed him,” she said. Eric’s brother, Brent, joined the Army just a few months after Eric enlisted in the Marines. Brent was sent home Thursday from training in California to be with his family. He was preparing to be deployed in June. He said Eric was working as a carpenter until he decided to enlist last year. “I haven’t shed a tear because I knew he was happy to do what he was doing,” Brent said of his brother. Brent said Eric was well aware of the dangers he faced when he enlisted and when he was deployed. The family was told of Eric’s death Wednesday night. His parents traveled to Delaware yesterday to retrieve his body, accompanied by Eric’s wife, Kaila. Kaila and Eric were married in September in North Carolina, where they recently purchased a home in Holly Ridge. Friends and family members said Eric was likeable, a person they all admired and learned something from. When he was deployed, Brent said, Eric was promoted to be the person to lead other soldiers and give commands. The job suited him, Brent said, because of the way he taught the people around him. “Eric taught people to be a better person every day,” said Chris Healy, a family friend who looked up to Eric. Brent said his older brother was like a father figure to him and his six other siblings, who range in age from 7 to 23. He was always there to talk to about anything. “He would do anything for his family,” said Dilan Currier, 17. The last time the family saw Eric was at Christmas, just days before his deployment. He was a little quieter than usual, Brent said, but was happy to be going to Afghanistan. “He felt the people there needed him for a good reason,” Brent said. When he was home on leave, family members said, Eric enjoyed hunting and fishing. 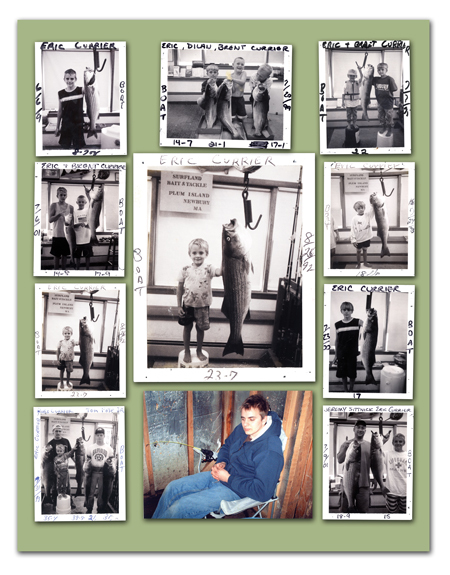 His grandfather, Russ Currier Sr., said yesterday he started taking Eric on fishing trips when he was just 3 years old. “He loved to be outdoors,” his grandfather said. Family members said Eric was a skilled hunter and almost always came home with a kill. Brent said he and his older siblings grew up in Methuen, but the family moved to Londonderry about eight years ago. Eric was a 2007 graduate of Londonderry High School’s adult education program. Principal Jason Parent said Eric was well respected as a student. “He had a lot of friends and the faculty all thought very highly of him,” Parent said. Two N.E. Marines are killed in AfghanistanTwo Marines from New England have been killed in combat operations this week in Afghanistan, authorities said. Pfc. Eric Currier, 21, of Londonderry, N.H., who has Massachusetts ties, was killed on Wednesday in Helmand province, the US Defense Department said on Friday. Currier was hit by a sniper’s bullet just above his body armor, said his grandfather, Russ Currier, of Methuen, Friday night. Pfc. Kyle J. Coutu, 20, of Providence, died on Thursday, also in Helmand province, according to the Defense Department. Further details on Coutu’s death were unavailable Friday night. Both Marines were assigned to the 3rd Battalion, 6th Marine Regiment, 2nd Marine Division, 2nd Marine Expeditionary Force, based in Camp Lejeune, N.C.
Born in Lowell, Currier grew up in Methuen until the eighth grade, when he moved to Londonderry with his mother. He spent his summers on Plum Island, his grandfather said. Currier joined the Marine Corps in March of 2009 and deployed to Afghanistan in January. His grandfather said that after Currier arrived in Afghanistan, he told family members he was pleased to be a part of the mission there. In September, Eric Currier married Kaila Parkhurst, formerly of Haverhill. His grandfather said Kaila was with Eric Currier’s parents in Delaware Friday night awaiting the arrival of Currier’s body at Dover Air Force Base. In a statement, New Hampshire Governor John Lynch expressed his condolences for the Currier family. Friends and neighbors of Currier’s remembered him as a social and affable man who was well-liked in the community. Newbury resident and friend, Stephanie Culbert, said that he enjoyed fishing on his grandfather’s boat, swimming, basketball, and joking with his siblings. Eileen Fahey, who lives near the grandparents in Newbury — where they also reside — remembered Currier as a “wonderful kid” who spent a lot of time with his family. Fahey said that her daughter, Katie, a friend of Currier, called in disbelief from Georgia when she heard that he had died. Russ Currier said a memorial service will be held, although he did not yet know a date. Elise Coutu Lanzi, a cousin of Coutu — the Rhode Island Marine who was killed — teaches at Tolman High School in Pawtucket, R.I., where Kyle grew up and graduated in June. She said he was popular among his peers. Kyle’s uncle, Henry Coutu, said he played football and hockey, among other sports, at Tolman. He also said that Kyle Coutu chose the Marines because they were ‘‘the best trained’’ branch. ‘‘He said to me, ‘Uncle Henry, it’s because they’re the ones who do the work,’ ’’ Henry Coutu said. Greetings, this is really a truly absorbing Internet blog and I’ve cherished studying several of your content and posts contained on the web internet site, keep up the exceptional function and want to go through a great deal a lot more stimulating posts within the long term.